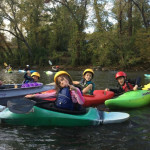 Nantahala Kids Club Spring Session is Coming!!! Its that time of year again! The Spring Session of Nantahala Kids Club will start on April 18th. Our first session will meet at the Finger Lakes at 4pm. You must pre-register online. We will not be able to accept day-of registrants!